hi what type of shades are these? Stein mart carries colorful bedding! Pillows - Where are the euro pillow covers from? That fabric is Thomas Paul Blossom fabric in the color smoke. 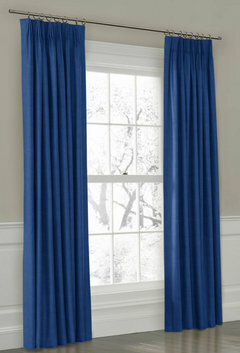 I have some custom drapes in the same fabric and it's beautiful, however I'm pretty sure it has been discontinued. Curtains - Where are the curtains from? I would like this info as well please. we love this color combo-- and what a stunning room! 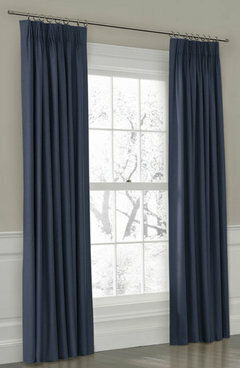 i think you are going to love our euro pleat drapes shown below in two different dark blue tones. feel free to check us out and give u a shout-- we would love to work with you on this project! Blue and White Pillow Shams - Hello, can you kindly tell me who makes the Blue/White pillows on the bed? Beautiful room. Any ideas where this rug, or a similar one, can be found? I am bringing my Navy Blue and White Ralph Lauren Bedding out again for my guest room. Renovating our home again and does have slight accents of coral. I would like to repaint the room. May I please have this room color I think it works very well with Navy ? Also I am installing Walnut wide planks on floor. Rug - Where can I get the rug and what is the brand? Headboard - Is the headboard custom? Love the mix of the modern with the wood base. Thx. Wall color - Pretty wall color. Does anybody know what color can match it with in sherwin williams? Size of Long Pillow - I like the size of the long pillow, what is the size and where from? Please tell us where this bed is from!! It is amazing! Does anyone know where the bed is from? Someone asked but no answer. Could you please share the paint color? It is just what I'm after! Love the rug! - What are the dimensions and where can I get it? Wall color? - What color is used in the walls? I would like more informatiion on the 3 pictures above the bed. What is the rug measurement? Chair - Where can the chair be found in this room? What color is on the wall? Where is the bedding from?